We are faced with the problem, obvious from the beginning, that packing talks at 3 per hour (with discussion) into the one session planned is going to present serious obstacles. Here is a compromise proposal skeleton. If our ‘one shot’, following a suggestion by Alan Chalmers, is to be on ‘how we actually do this stuff’, then some selection from  and/or  would be presented. In that case, one does doubt that six quick paper/discussions will be very satisfying – we’d need more expansive papers and discussions. Hence, additional expansion into the concurrent AAHPSSS Conference would be the recommended strategy. If something like  or  were decided upon, that would appear to be it, a nice two hours could probably be designed, staying entirely within the National Committee allocation. But, is that all we’d wish to do? Why not expand into some AAHPSSS time slots by pre-planning and bidding now? Hence, compromise: we work out on this blog what activity will take up the ‘granted’ two hours; but we do that planning to put in for at least one more session at AAHPSSS 26 to 28 September, University of Sydney (at any time except at the appointed two hours with the National Committee Session). The purposes of expanding into AAHPSSS are to fill out whatever our intended program turns out to be, and to ‘bring Early Modern HPS back to AAHPSSS‘ – and the latter surely is one outcome envisioned by those who created and offered the initial 2 hour National Committee slot. The strategy in this paragraph is my preference. Many experimental philosophers were committed to the view that a science of nature would ultimately be a demonstrative science. In other words, natural philosophy should be a form of scientia based upon propositional axioms or first principles and derived via demonstrative reasoning using syllogistic logic. This feature of much early modern experimental philosophy provides a problem for those who interpret it through the rationalism/empiricism distinction. For, it seems to be a characteristic of rationalist philosophers that they aim for the demonstrative ideal whereas the so-called empiricists, it is claimed, opted for a form of probablism. And yet many so-called empiricists were committed to the demonstrative ideal. One such philosopher was John Locke. Interestingly, however, Locke developed his own theory of demonstration that was based upon his theory of ideas and not upon the Aristotelian conception of scientia. Locke claimed that demonstrative knowledge is not knowledge derived from true propositions but rather the perception of the agreement or disagreement of two ideas with the assistance of a third, intermediate, idea (Essay II. xvii). As such Locke’s theory of demonstration was pre-linguistic (that is, it doesn’t have to do with statements that are capable of truth or falsity), even though he freely admitted that the transition to verbal expression of these thoughts is irresistible (Essay IV. v. 3–4). Now, Locke called his intermediate ideas proofs (Essay IV. xvii. 2). 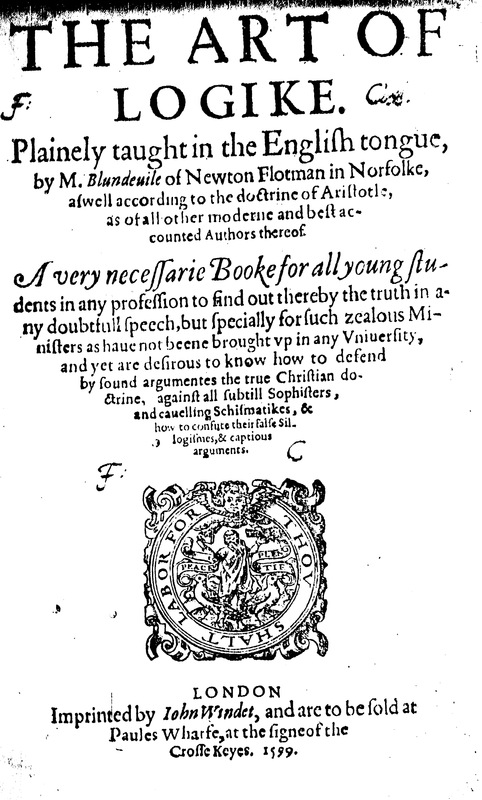 This seems to be a rather odd use of the term ‘proof’ in early modern English. It does not appear in the OED and it may be thought to typify a theory that was unusual or even idiosyncratic. It seems, however, that there might have been a precedent for this in English logic. It is interesting to note here not only the use of the term ‘proofe’ for the mean term, but also the claim that the major and minor terms of the premises are made to ‘agree’ by the mean term. Locke’s terminology parallels this very closely, only he applies it to individual ideas like black and white rather than to propositions. For Locke it is the ideas that agree rather than the terms and the proof is the intermediate idea rather than the middle term. 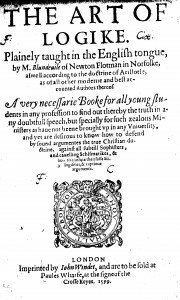 Now, there is, to my knowledge, no evidence that Locke read Blundeville’s Logick and yet Blundeville’s is the only English logic text in which I have found this meaning of the term ‘proof’. So what is the origin of Locke’s terminology? If any readers can shed some light on this I’d be most grateful.